Don’t leave Vienna without eating a Wiener Schnitzel. You will find the best Schnitzel in town at Figlmueller’s (http://www.figlmueller.at/wollzeile.php). 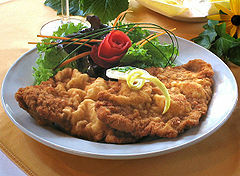 To find out what a Schnitzel is, visit http://en.wikipedia.org/wiki/Wiener_schnitzel. The meal is often eaten with a authentic Viennese potatoe salad and/or rice. This entry was posted in Food and tagged food, must-do vienna, typical austrian food, wiener schnitzl by admin. Bookmark the permalink.